A couple of days ago, about 12°C (52F) and sunny, still no fresh high value pollen (some from early blooming trees). I was visiting this apiary taking care of the fistsize colony mentioned in an earlier post. It was robbed and had just a few bees of their own left. 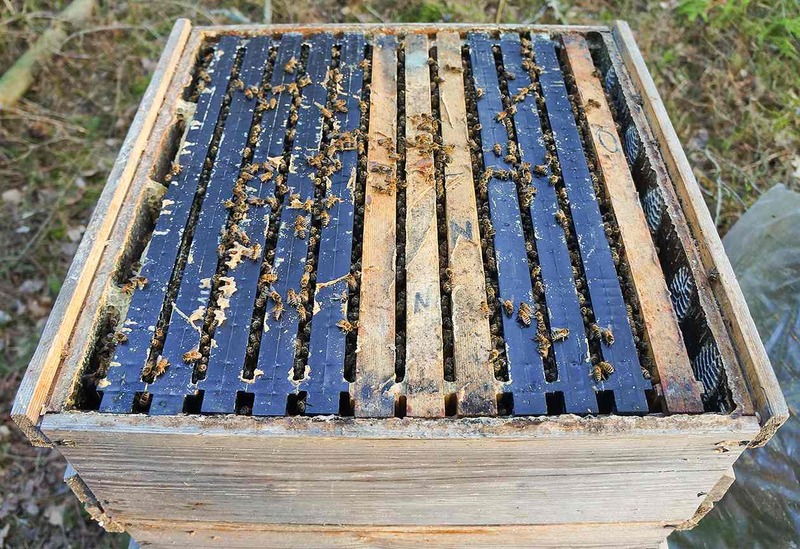 Shook off the bees and took home the boxes to sort the frames, some for the solar wax melter, some with food to give to others and those nice looking empty drawn combs for increase later on. 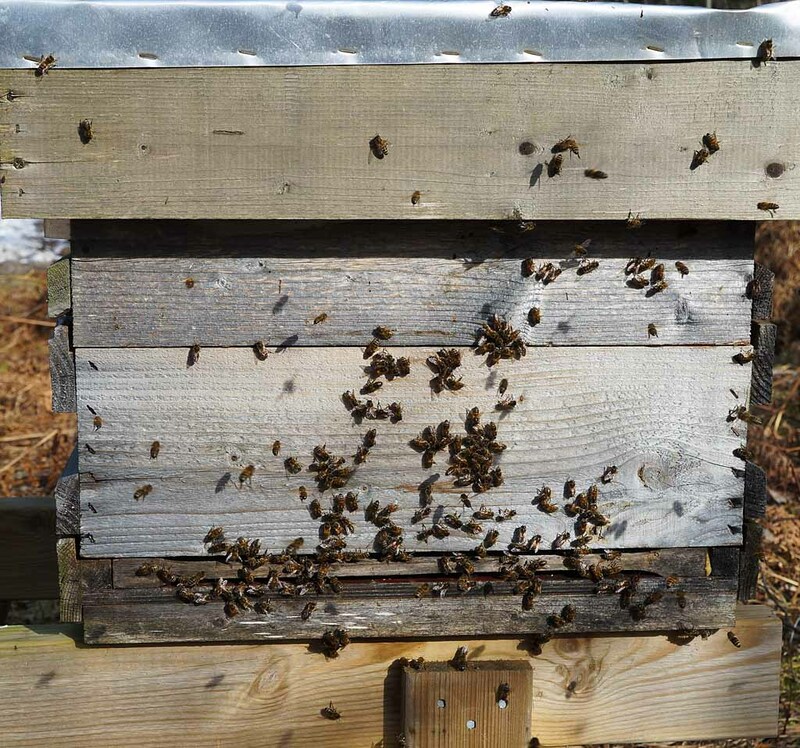 In US I understand it’s more common than in Europe to let the bees keep honey for winter. On the other hand I’ve heard more and more beekeepers giving sugar for winter. And the discussion which sugar is the best for wintering. It seems sucrose is the best, from cane or beet. Of the sugars. The very best is of course honey. But is it, if sugar is much cheaper? And how is it, doesn’t honey produce a lot of residues filling up the guts and producing dysentery and bad overwintering? Yes it might, if you have bees making a lot of brood during winter, thus having to eat a lot. And without any possibility for cleansing flights. 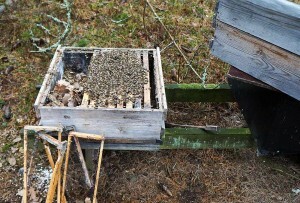 In older times in Sweden honey was used a lot for wintering bees. In fact I saw a comment in an old beekeepers magazine that this particular year the autumn flow had been bad so the bees had had no opportunity to gather winter stores on the Heather. Heather honey today is said to create big problems for bees’s if overwintering on it. A tixotropic dark strong honey. 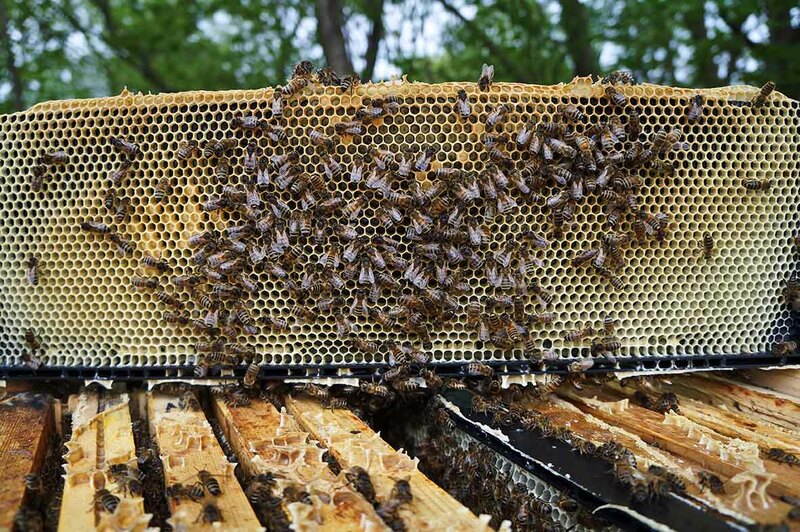 In Sweden normally the bees are confined to the hive without any cleansing flight for at least five months. What’s happened I think is that bees that brood too much in winter to be able to winter on difficult honeys are surviving because they have been wintered on sugar to the biggest part. We have weakened the bees and because of greed, thinking we are smart. It had been a better investment letting the bees keep enough honey for winter to make up at least the major part of the winter food. Tobias Olofsson and Alejandra Vasquez have discovered many lactic acid bacteria are important for the health of bees. They live in the guts of bees and feed on nectar, honey and pollen, just as bees. They originate from other bee guts, not from flowers, but bees that visit flowers share these microbes that way too, besides directly in the hive to new generations. They are continuing their research concerning overwintering on honey or sugar. In an article in the Swedish journal Bitidningen Tobias is describing a new product for boosting bees with lactic acid bacteria. 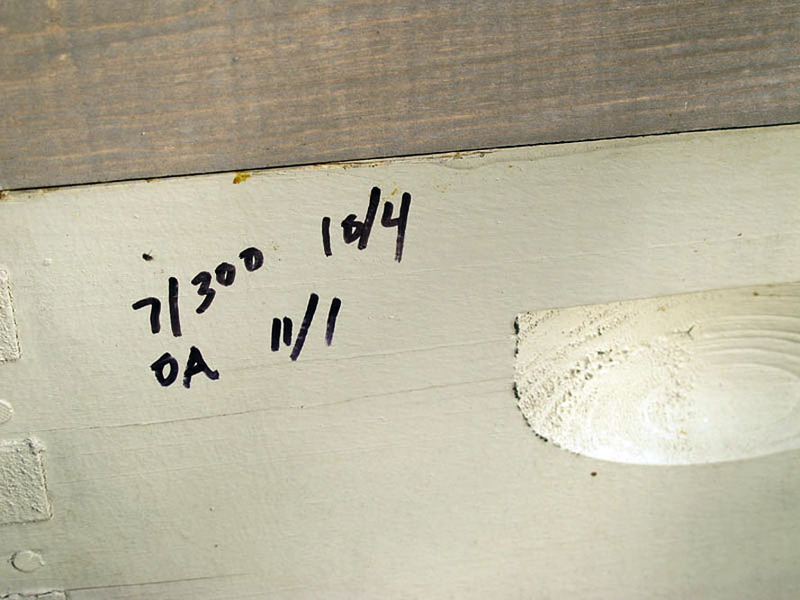 http://dmweb.v-tab.se/webpages/Bitidningen/bitid-13-0010.html, page 11-13. He is also describing a small test finding out what happened with the lactic acid bacteria when wintering on honey (2 colonies) and on sucros (2 colonies). The number of bacteria was much lower in the sugar colonies. These colonies used much more food, their colony strenght was much lower and they were irritated in temper. Olofsson and Vaquez have produced a product they call SymBeeotic which is supposed to be used to boost a colony with low amount of lactic acid bacteria, for example after winter. But of course it’s better to leave enough honey in the colony for winter. The bottom box with the cozy home of the mouse. To the right the two upper boxes full of bees, waiting for return on top of the bottom one. You know there is a front and a back, and up and down, and sideways, on combs and foundation. Ever seen the Y at the bottom of the cells? 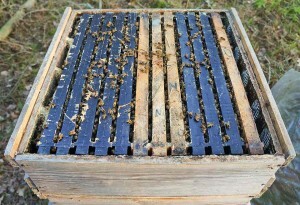 The side of the comb with upside down Y:s is said to appear towards the middle of the bee cluster, when the bees build their own home of combs. When Y is facing up, or down, the cells have tips pointing upwards and downwards. Are tips pointing sideways (and not parallel sides sideways) Y at the cell bottoms (hold the comb or foundation against the light and it’s easier to see) is facing right or left. Such combs is said to appear sometimes in the middle of the cluster of naturally drawn combs. 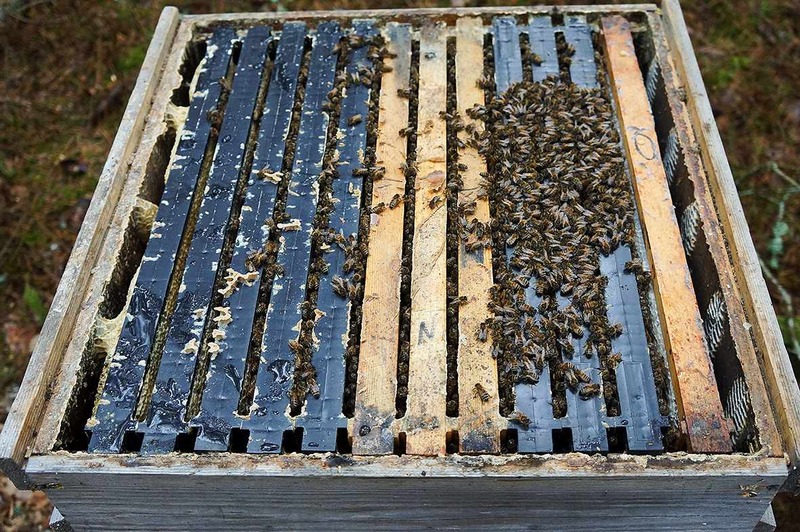 To place combsides with Y pointing downwards towards the middle of the box (easiest marking new combs with foundation on the toplist) is said to be beneficial for the bees – where they sit in the box, development, harmony, etc. Anyway I couldn’t figure out that it could be possible to be negative for the bees. So I started to mark new combs last year and had the intention to test natural positioning. But it turned out I seldom put on a whole box of foundation. I did though on one hive, almost. And it happened to be mostly plastic frames with plastic foundation from Mann Lake, with cell size slightly bigger than 4.9 mm. I tested Mann Lake’s standard plastic frames and foundation last year too. 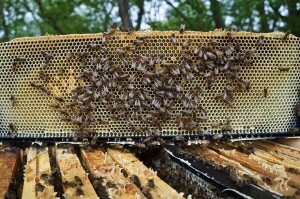 And this hive turned out to be the one receiving highest number of plastic frames for testing. So this hive became a testhive for both plastic frames and natural positioning. A bad test actually. Just using one colony and for two parameters. Anyway, had the colony died or dwindeled or turned out to develop weird in any way it had pointed to negative effects for at least one of the tested two parameters. At best one could say now that it would be interesting to continue the tests, with both parameters. Because the outcome seems to be positive. It turned out to be a hard test concerning overwintering. Not though because of hard weather. The winter before (2012-13) was colder and longer and the colony came out weaker from winter than this spring 2014. 2012 it was treated against Varroa with 10 grams of thymol in total and nothing else (two pieces of dish cloth with 5 grams each). The colony was wintered on three shallow boxes (12 frames) full of bees with 25 kg of honey (>50 pounds) and 10 kg of sugar (>20 pounds). 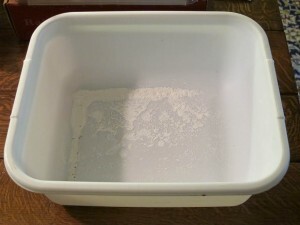 It came out of winter (March 1) as strong as it went into it and heavy of food. Though I had forgotten to put on the entrance reducer so that a mouse had made it comfortable for itself as its winter house, both warm and food nearby, cozy. 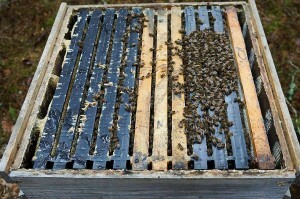 The bees hadn’t had their cleansing flight yet, confined to the hive since middle of November. The cleansing day came March 9. 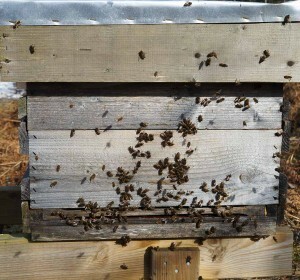 After cleaning the bottom box from eaten empty frames and the cozy remnants of the mouse March 1 I returned two weeks later and the colony was happy, and no bee droppings on the front of the hive, still full of bees out to the sides also in the top box. With so much honey in the stores for long winters like ours it’s not unusual with bee droppings on the front of the hive. – maybe all three of these parameters? Autumn was warm, with bees flying in november. That’s rare. Winter was mild, only 2-3 weeks with steady freezing temperatures day and night in January. That’s rare too. Spring has come slow with temperatures just above freezing. Sun is rising more and more above horizon. Those days we’ve had sun, which havn’t been many. Now it’s warming in the middle of the day. Sunday March 9 the great day came, when the bees flew out in their big bathroom after confined to their bedroom for many months. I wasn’t careful where I parked the car, in the open about 100 meters from the hives. The bees happily spotted the shining roof and shouted: Toilet! And dropped what they had had collected during winter. Last year I used treatment against Varroa on much fewer part of my hives than previous years, 50%. That’s because no more had given me the sign for treatment, wingless bees. And 36 colonies were potential breeders in autumn, the bees in those colonies hadn’t been treated last year or the year before. All of these have wintered very well so far. The year before (2102) I wintered 11 potential breeders. I used 5 of them for breeding last year (2013). 2011 I wintered 3 potential breeders. 2012 I used 1. Regardless of how many pass the test for breeding this year, I will probably not breed from more than about 5. The others I will at least take a walk away split from. Two colonies have died so far, out of 170+. That’s 1%. I can’t remember when I had such a good overwintering before. But probably some more colonies will die. These two colonies are both afterswarms (with virgin queens) in July last year, from the same colony. A colony that have never been treated against Varroa. It have VSH-index 40%, but somewhat grumpy in temper and gave a small crop. Both colonies were of course small going into winter, but have been sitting still with a tight cluster until March 9. They have eaten very little food until now. 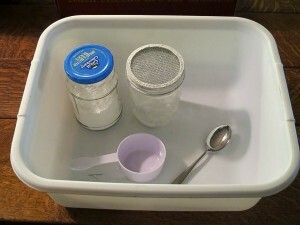 Marco Moretti made a valid comment to the sugar shaker post. It doesn’t surprise me that Antonio Nanetti found checking mite populations besides a real treatment is unreliable. It is many factors making the results uncertain. 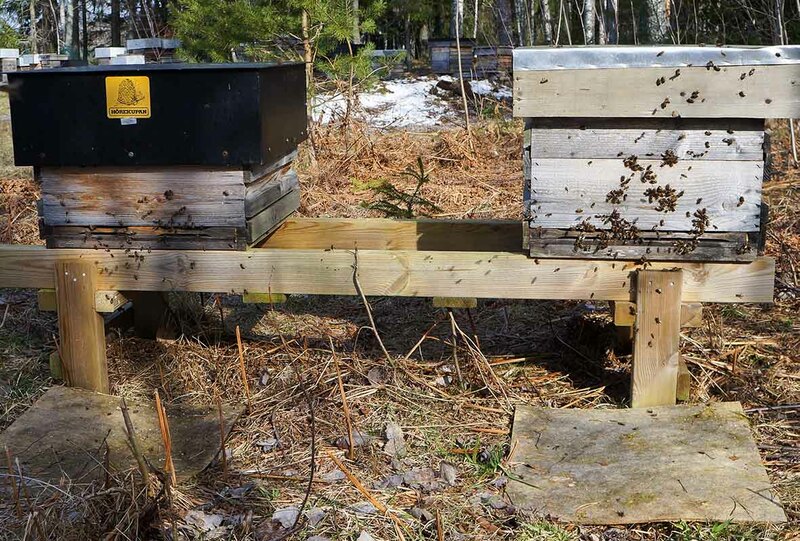 Why beekeepers want to do this anyway is to get an idea when it’s time to treat against the mite. If you do an oxalic dribble, or trickling, you make a real treatment. And that’s okey with me, if you choose to do that. Before making a real treatment the most reliable mite test is said to be alcohol washing like with the bee shaker described in this blog. The sugar shaker might do well for others. According to findings in USA described by Dennis van Engelsdorp those beekeepers that checked mite populations with alcohol wash, thus keeping track of the mite population had the lowest winter losses, of those beekeepers treating regularely. That’s also one of the resons I don’t count mites. I check for virus problems in the hive before treating. The easiest virus and the one most common when mites are becoming many is Deformed Wing Virus (DWV). Maybe that’s too late normally to save the colony. I don’t know. But fortunately I don’t have ”normal” bees. Also a reason for me not counting mites, but looking for DWV, is that I want my bee stock to develop strong varroa (and virus) resistance. 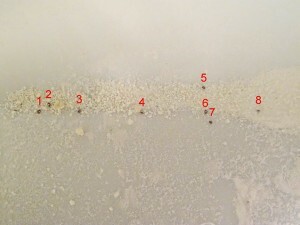 Larry Garret uses the powdered sugar shaker method to count mites. The method works well for his smaller number of colonies at each apiary and the tools are very easy to transport and store. 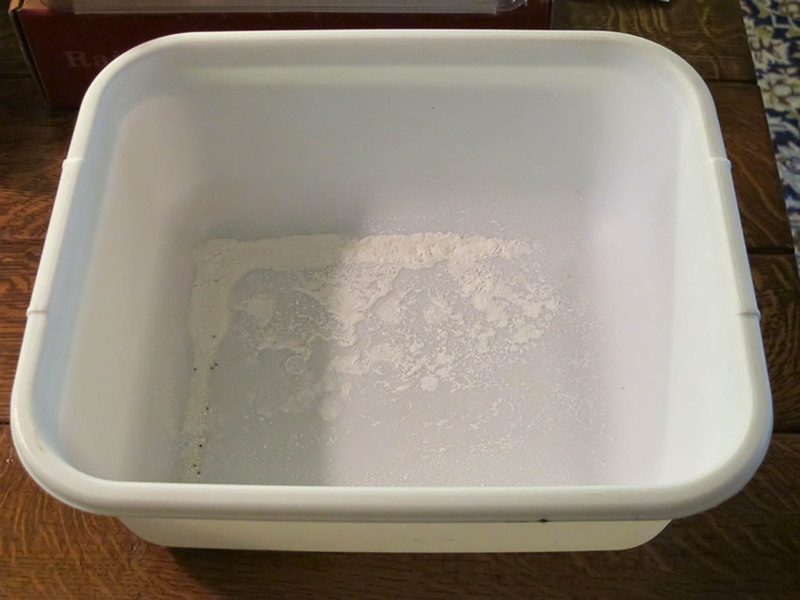 Although there may be a slight difference in the actual counts provided via sugar shaker from those provided via alcohol wash the key is that the method and counts are consistently reproduced for comparison, he says. Above is a picture with his tools, below a result. After each “shake” he writes the results on the back of the hive. 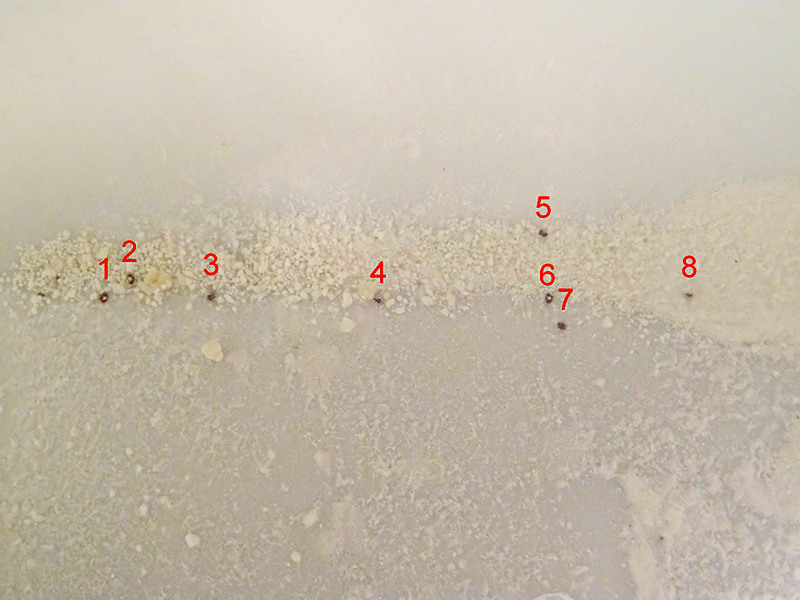 The photo below shows a “hive log” of 2.3% mite infestation on 4 October with an oxalic acid dribble on 1 November.